Emilia Delizia has been recommended by other travellers! 3 gourmet foods in one day book today to reserve your place! 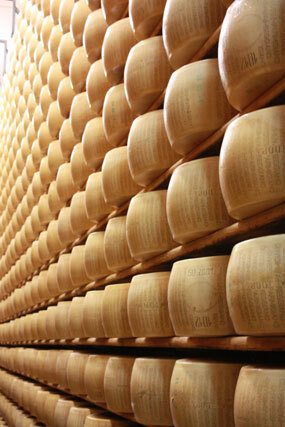 Parma: PARMESAN TOUR with NICE accommodation EXCLUSIVE! Plus Parma ham and balsamic vinegar experience! Bologna: accommodation in central Bologna with cookery classes and gourmet tour - only at Emilia Delizia! Our food tour service is a new way to explore Italy and make the most of your time while you are here. Our service can be personalised to your needs as we only do small groups up to 6/8 participants. Our Italian food and wine tours are flexible and affordable to maximize your pleasure while on holiday in Italy. We offer one day tours which are inclusive of gourmet lunches and wine, visits to historical towns, food tasting, guided tours to wineries and food producers. Visitors can also choose multiple day tours. The cost is all inclusive of agriturismo accommodation, breakfasts, guided visits to, wineries, gourmet excursions, balsamic vinegar producers, Parma ham and fresh pasta manufacturers. Our tours include tasting and visits to the most renowned food producers as well as historical landmarks and UNESCO sights. All year round is also possible to visit culatello di Zibello producers so see how it is still traditionally manufactured, and combine gastronomic tour with a visit to one of the many Parma Duchy's castles. We guide tours mainly in the towns of Piacenza, Parma, Reggio Emilia, Modena, Bologna, Ferrara and Rimini. We offers a range of suggested itineraries and we specialised in gourmet and food tours in Emilia Romagna. We follow many of the gourmet food routes available in the area. Bologna to Modena, wines, castles and cherry trees. Our guided tours are specifically themed on the location we visits, such as art tours, gastronomic tours, wine tours, shopping tours. Visitors can also combine their holidays with Italian language lessons or cookery lessons. Visit Rimini and Ravenna and its wonderful olive oil in Brisighella in Romagna, not far from Bologna, near the town of Rimini and Ravenna. Sunny rolling hills hide many olive trees along with Sangiovese vineyards. Wonderful products to to accompany formaggio di fossa, pitted cheese from Solgliano al Rubicone. Emilia Delizia Travel in Italy Food Blog.